Ensure your commercial property is always ready to impress with a full-service commercial cleaning company! Aim Cleaning Company provides superior cleaning services to businesses in Berks, Chester and Montgomery counties to ensure you’re always ready for that no-notice drop-in. We take care of the cleaning so you don't have to! With a suite of services that includes everything from seasonal flooring and carpet care to weekly dusting and sweeping, we can create a custom cleaning package that will save your business money. So why settle for doing it yourself — or worse, paying someone else too much to do it? 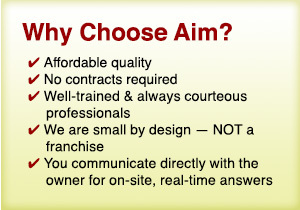 We invite you to learn more about Aim Cleaning Company and browse our full list of commercial cleaning services.